Some of you may already know this and some of you may not know but so far the film has been funded by my personal credit cards (thanks VISA & CHASE) and generous community support. I'm having a hard time keeping up with my minimum payments SO I've put all our T-shirts on sale to help raise some quick funds. Hope everyone's summer is going well-- we are chugging along editing. More updates soon and thanks as always for your interest and support! Just got back from LA where I got to be a part of Felt Club (www.feltclub.com) it was amazing and I'll have photos up very soon. Just posted these leftover Art vs. Craft totes up on our etsy site, they are super rad. I took only 5 to LA with me to sell at Felt Club and they all went within the first hour! More details on felt club soon! Finally got around to putting these puppies in the etsy shop! See you in Los Angeles at Felt Club on Sunday! Okay okay SO much news.... First, my baby, Art vs. Craft was a huge success. Pictures are up on flickr HERE. I'm sitting here with Cris my editor chipping away at transcribing hours upon hours of footage. We just wrapped up working on Stephanie Syjuco's interview and now we just started Erin Weckerle of Sodafine who is talking about organic fibers and production from beginning to end. Also, it's safe to announce the BIG news which is (drum roll please......) Princeton Architectural Press will be publishing a book that will be a companion to the film. It will be a separate project that will hopefully come out around the same time as the film. More details soon, but HOW EXCITING! PA Press is the same publisher that put out "By Hand" and "DIY by Design", both super great books supporting the creative community we are documenting. 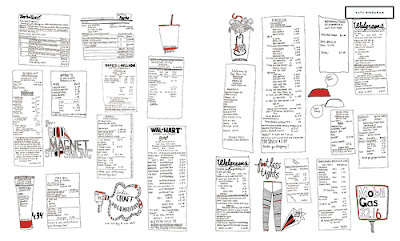 Kate Bingaman's spread in Print Magazine is out, she included a logo off of the tote bag she purchased to support the film!!! Super rad! Thanks Kate! (little side note: Kate will be illustrating parts of our book with PA Press!!) 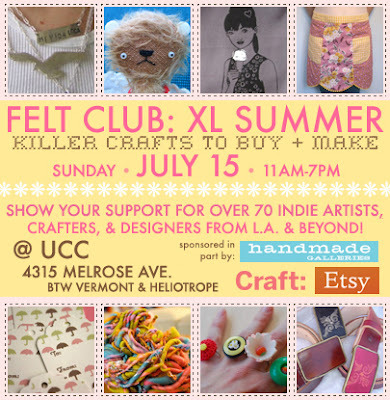 Last but not least, join us in Los Angeles this weekend for the fantastic FELT CLUB put on by Jenny Ryan! 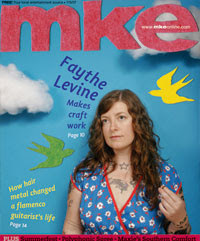 Director of Handmade Nation, Faythe Levine, makes it onto the cover of MKE, the Milwaukee weekly paper!! 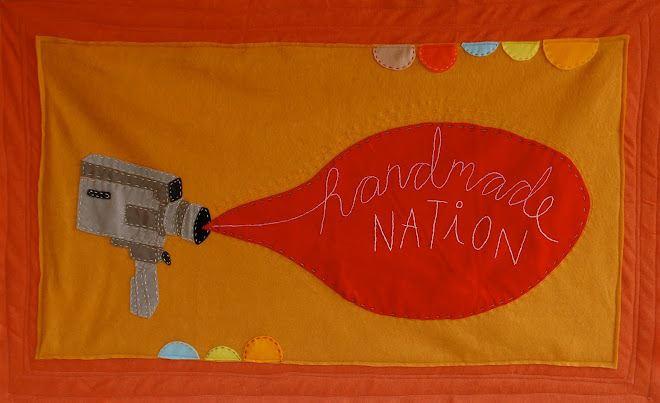 Read the article here where they discuss the film, her shop and the craft fair that is happening THIS WEEKEND, Art vs. Craft!! Also, we just put up our new shirts in the ETSY SHOP, get em' while they last, American Apparel 50/50 blend T's in a really good Orchid color and Evergreen color!! FREE SHIPPING in the United $tates!